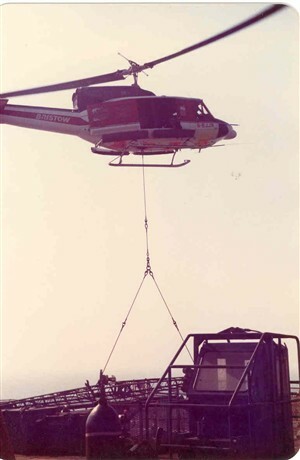 Helicopters were used to transport workers and some equipment to and from the rigs. If the weather was stormy or foggy flights could not take place and workers were stuck on the platform until it cleared. Offshore workers have described the health and safty onboard the helicopters as nonexistant in the early days: with men and equipment all in together with no safty regulations, people could even smoke during a flight. 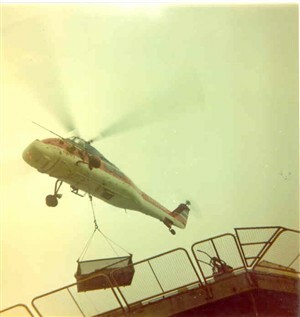 Later the health and safty improved and workers had to undergo emergency training before traveling in helicopters and wear protective suits whilst flying.